Congratulations to the Lighthouse Learning Ceter for Children™ Pre-K graduates, Class of 2017! Proud parents and teachers looked on as six adorable four- year olds, both sighted and visually impaired, paraded into the classroom to receive their Certificate of Achievement. 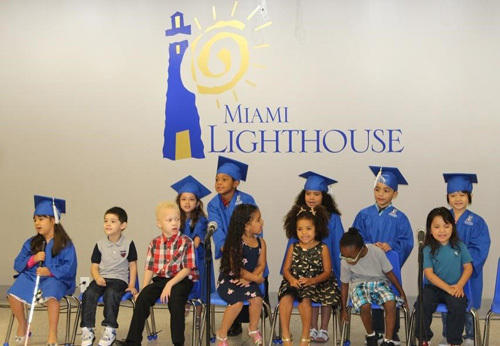 Wearing caps and gowns for the big event, they were welcomed by Virginia Jacko, Miami Lighthouse President & CEO. The three-year olds in this first-of-its-kind inclusive Pre-K program also were awarded Certificates of Completion marking their year with the class as well. The students performed three offerings for their parents and guests: "Beautiful Day", "I've been going to my preschool" and "You Are My Sunshine". Our graduates Dads were also treated to a pre-father's day gift. 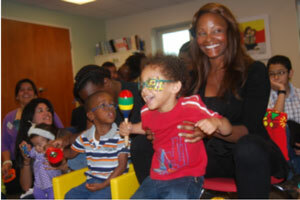 What could be more fun than to offer those attending the Pre-K graduation a complimentary shave by The Art of Shaving. Vice President of IT for The Art of Shaving Rafael Niebles, and his staff of delightful cosmeticians, introduced both the girls and boys to the feel of cool shaving cream on their little faces, followed by the introduction of popsicle sticks to imitate razors that would be used in an actual shave. The kids had a blast as the photos show! 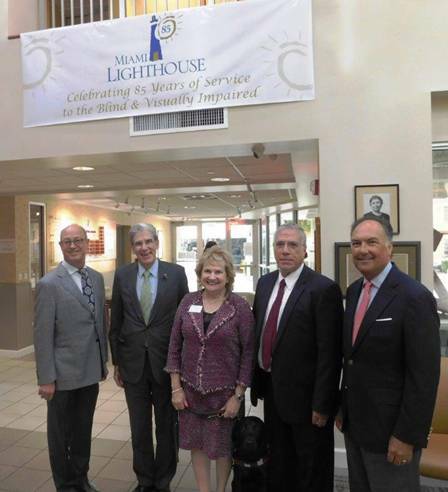 Dr. Julio Frenk, President of the University of Miami, toured Miami Lighthouse for the Blind's programs and explored innovative new partnerships between Miami Lighthouse, University of Miami Frost School of Music, and Bascom Palmer Eye Institute. 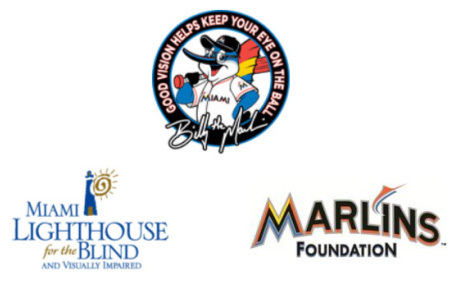 Miami Lighthouse for the Blind and Visually Impaired joined the Marlins for the annual Beep Baseball Classic on Monday, February 15th. 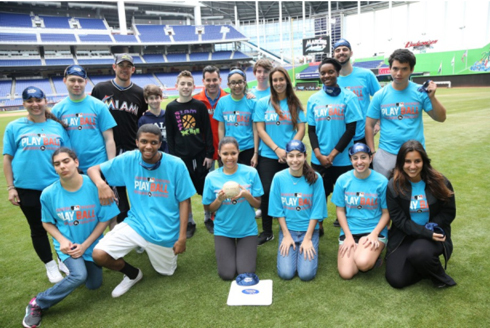 Miami Lighthouse's Transition students teamed up with Marlins staff to compete in two games that were hosted simultaneously at Marlins Park. Beep ball is an adaptive version of America's favorite pastime for the blind and visually impaired. There are some differences from regular baseball. There is no second base. First and third bases, four foot padded cylinders with speakers, are placed 100 feet down their respective lines and 10 feet off the foul line. This is to prevent a runner from colliding with a defensive fielder. The bases contain sounding units that give off a buzzing sound when activated. The batter does not know which one will be turned on. When the ball is hit, the base operator activates one of the bases. The runner must identify the correct buzzing base and run to it before the ball is fielded by a defensive player. If the runner is safe, a run is scored. 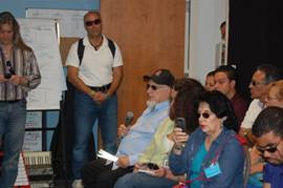 If a sighted players are participating, they are blindfolded. Following the games, awards were given out to players and teams who exhibited most team spirit, sportsmanship, best team name, best team chant, and wackiest team. The competitive and playful nature of the Beep Ball Classic brings to life Miami Lighthouse for the Blind's slogan: "It's Possible to See Without Sight™." Publix, where “shopping is a pleasure,” made Friday, April 17th a true pleasure for Miami Lighthouse by selecting us as the recipients of their “Publix Serves Day.” Publix founded in 1930 and Miami Lighthouse founded in 1931 are celebrating their 85th anniversaries, and Publix is celebrating by giving back to the community. Our “day” consisted of Publix associates beautifying the Lighthouse facility with the laying of sod, mulching and planting herbs and vegetables to create our very own healthy garden. We will be maintaining the new plantings as part of our High School High Tech Program for our teenagers as an opportunity to teach them about gardening. 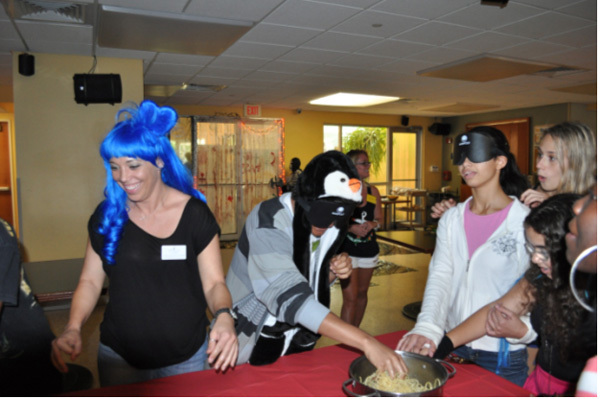 The associates also served lunch to our blind and visually impaired clients as well as members of the Lighthouse staff. “We are proud to support the work of an organization that provides an essential lifeline to those who need it most in the communities where we work and live,” said Nicole Krauss, media and community relations manager for Publix’s Miami Division. And we loved having you visit with us, Publix!. 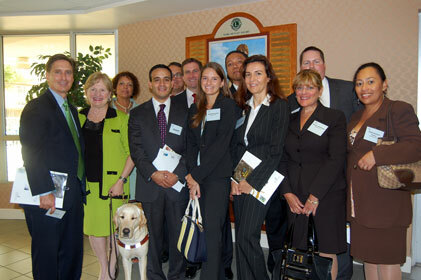 Publix Super Markets team with Virginia Jacko, Miami Lighthouse President and CEO. 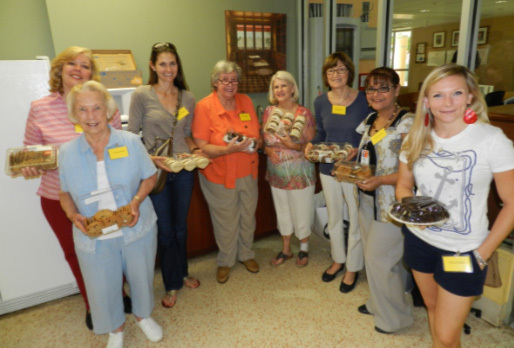 On Thursday, July 17th, members of the Alumni Group of the Delta Gamma Sorority volunteered at Miami Lighthouse. The volunteers helped prepare and serve lunch to the clients and brought an assortment of sweets for them to enjoy as dessert. The Delta Gamma collegiate and alumni groups are dedicated to being involved in the community and have helped at Miami Lighthouse on many occasions. We thank the Delta Gamma Alumni Group for their continued support and service to our organization. On May 9th, Perry Ellis International hosted a pre-mother’s day arts sale benefiting the Miami Lighthouse Social Group Activities Program. 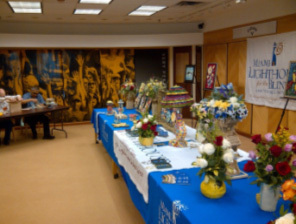 The event featured ceramics, paintings, jewelry and flower arrangements made by blind and visually impaired program participants. 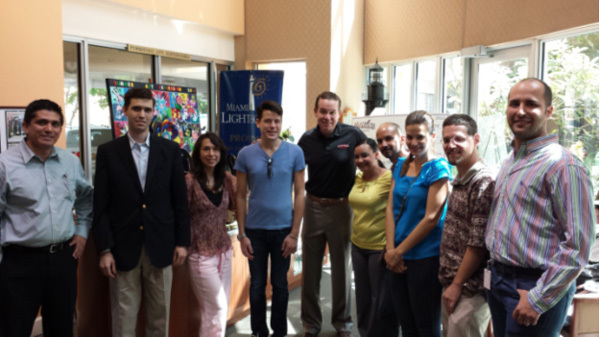 Clients and staff of Miami Lighthouse spoke to Perry Ellis employees about the beautiful arts and craft pieces. We thank Perry Ellis International for their continued support and hosting this event and we look forward to future partnerships. Joseph Roisman, Ruby Rios, Nelba Gonzalez, Lion Dilma Rodrigues, Lori Medici, Jesse Mclaughlin. 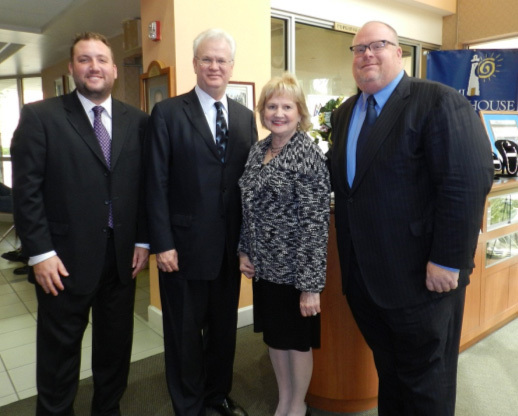 President & CEO of the Beacon Council Larry Williams and President & CEO of the Coral Gables Chamber Mark Trowbridge toured Miami Lighthouse for the Blind’s facility on March 27h. They visited the Sash A. Spencer Educational Empowerment Center currently under construction, the Better Chance Music Production Program™ and visited with visually impaired children on spring break learning life skills at Miami Lighthouse. The two business leaders also learned about Miami Lighthouse’s Job Readiness Program which analyzes a blind or visually impaired individual’s skills and interests to assist in the search for employment. Participants receive training in skills needed to enter, remain in or return to suitable employment. Other skills acquired include effective resume writing, job searching techniques and interview skills which are all practiced with expert coaches. 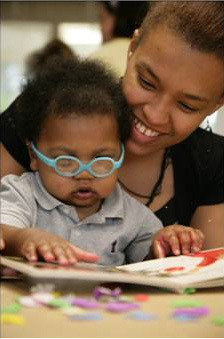 High-quality training in adaptive computer access using auditory screen reading and large print magnification devices as well as Braille reading/writing and the use of electronic book readers and electronic Personal Digital Assistance access is also taught at Miami Lighthouse. 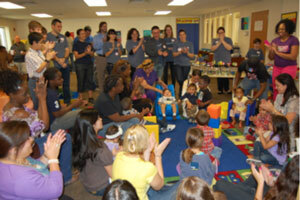 In addition, work readiness skills, social skills and basic communication are part of the program currently offered. We thank President & CEO of the Beacon Council Larry Williams and President & CEO of the Coral Gables Chamber Mark Trowbridge for spending time at Miami Lighthouse. 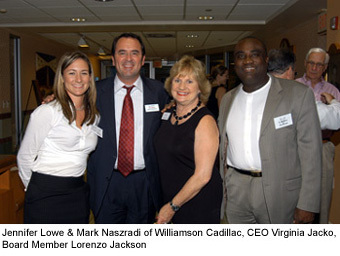 President & CEO of Miami Lighthouse Virginia Jacko and President & CEO of the Coral Gables Chamber Mark Trowbridge. We thank the Greater Miami Chamber of Commerce for spending time with us to learn about our programs President of the Greater Miami Chamber of Commerce Barry Johnson and Governmental Affairs Team, Daniel Tapia and Javier Hernandez toured Miami Lighthouse for the Blind’s facility on March 4th. The team visited the Sash A. Spencer Educational Empowerment Center currently under construction, the Better Chance Music Production Program™ and spoke with clients in the Social Group Activities area. Javier Hernandez, Barry Johnson, Daniel Tapia and Cameron Sisser. On Monday, January 20th, students attending Miami Lighthouse’s Better Chance Music Production Program™, Transition Program and Braille literacy students celebrated the Martin Luther King holiday with 30 peers from the Chapman Partnership. 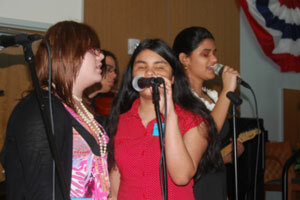 School-age children celebrated with music, such as, Michael Jackson's legacy song "Thriller" and many more. The Miamians Barbershop Chorus worked with students, teaching them harmony and rhythm. 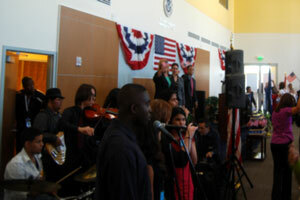 Our guests enjoyed performances by the Miamians and by our students who demonstrated their newly learned harmonizing skills. The audience included board directors and guests from both organizations. The Miami Lighthouse Transition teenagers also conducted a clothing drive so that their new friends can take these items back to their families. “This collaboration empowers these children and teaches them that nothing is impossible when it comes to fulfilling their dreams, just like the example set by Dr. Martin Luther King” said Trish Bell, Chairman of the Board of Chapman Partnership. 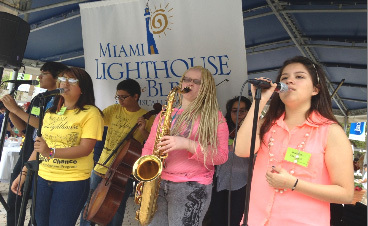 Miami Lighthouse Better Chance Music Production Program™ student musicians. KC Jones, President of the UM Sports Hall of Fame, John Routh, Executive Director and Tracy Kerdyk, Secretary and Chair of the Golf Committee presented a $1,000 check on January 22nd to Virginia Jacko, President & CEO, representing the Miami Lighthouse for the Blind. The UM Sports Hall of Fame donation is a contribution from a partnership between the two organizations that took place during the Hall of Fame’s annual golf tournament. 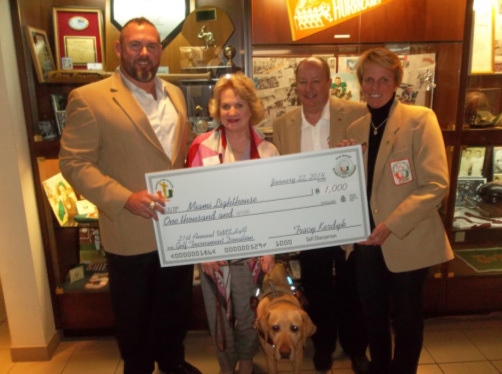 Miami Lighthouse for the Blind thanks the UM Sports Hall of Fame for their support. KC Jones, Virginia Jacko, John Routh and Tracy Kerdyk. Mater Academy East Middle/High School hosted a holiday arts and crafts sale for Miami Lighthouse on Thursday, December 12, 2013. 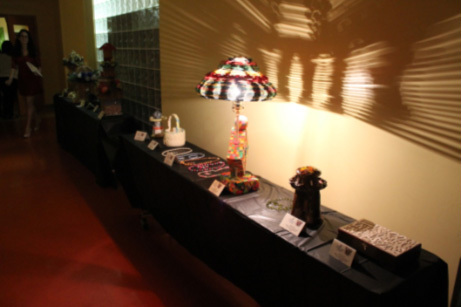 The sale featured ceramics, paintings, jewelry and other pieces of artwork created by blind and visually impaired participants of our Social Group Activities program. Students and faculty were joined by friends and family to enjoy a night of art, dining and fundraising. Seniors at Mater Academy East and members of the DECA Club, spent time at Miami Lighthouse learning about our programs and talking to clients in the SGA Program. Students shared their experience with guests at the event and expressed their appreciation for the services Miami Lighthouse provides to the visually impaired community. 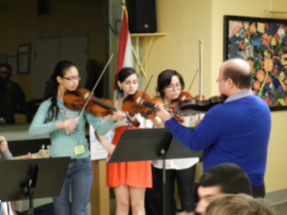 We thank Mater Academy students and faculty for the time they spent with us and for raising funds for the SGA program. Mater Academy East faculty and students; Miami Lighthouse staff and program participants. 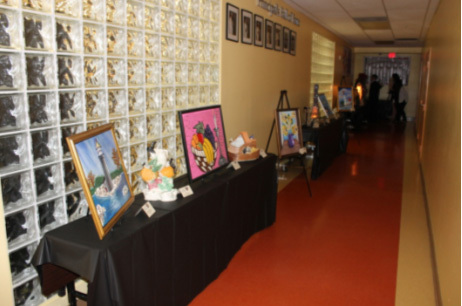 Artwork by Social Group Activities participants on display. 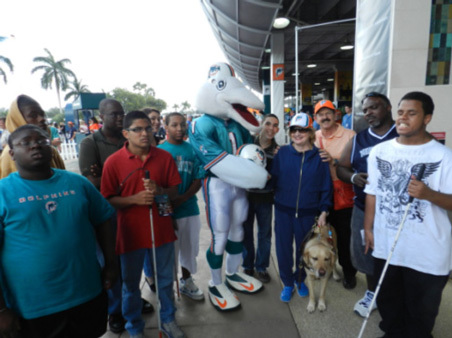 On Sunday, November 17th, Miami Lighthouse clients and staff toured Sun Life Stadium and had the opportunity to take part in a unique and exciting Miami Dolphins pre-game hands-on event. The participants were exposed to a multi-sensory experience by having a special touch tour of the stadium. They were also able to feel and handle equipment used in the game, including helmets and footballs. After the tour, the participants were able to experience the Dolphins take on the San Diego Chargers and defeat them 20-16. We thank the Miami Dolphins leadership for making this wonderful opportunity possible. 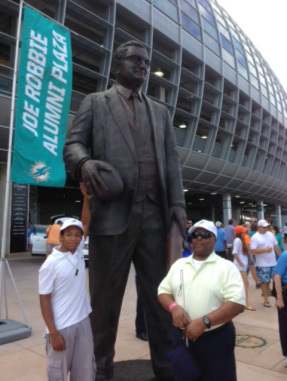 Miami Lighthouse program participants with Joe Robbie statue. 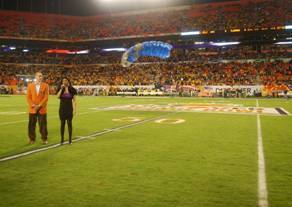 Miami Lighthouse program participants and staff on the field. 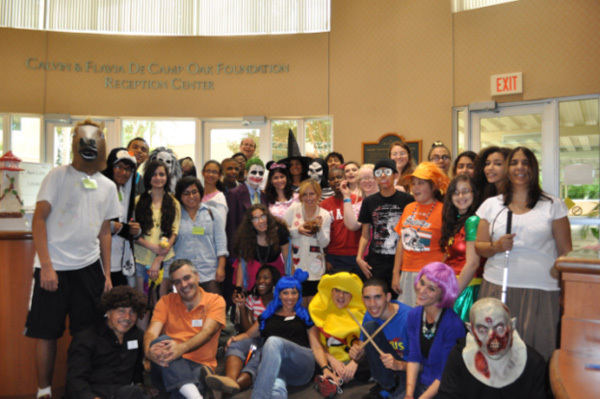 On Saturday October 19, 2013, 16 teens from the Transition Program put on a one of a kind haunted house for the participants of the Better Chance Music Program at the Miami Lighthouse. The haunted house was tactile and guests were blindfolded and led through spooky room where they had to touch brains, eyeballs, vomit (and other gross objects that were really just common grocery items). The teens gained invaluable job readiness skills because they had to plan and execute the event- each student selected a job as either a tour guide or a station master. The teens also got experience working in the kitchen boiling spaghetti for the guts and peeling grapes for the eyeballs. Lastly, they worked with the Orientation & Mobility Specialists in learning how to use human guide to safely guide others around their surroundings. Group Picture (Transition and Better Chance Music Program). 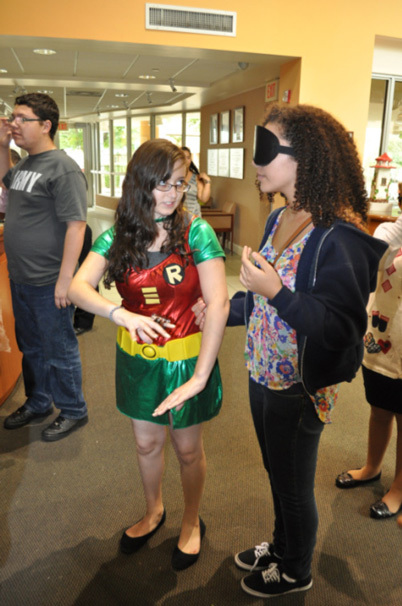 Transition Participant, Yesenia Hernadez guiding a blindfolded student from the Better Chance Music Program. Better Chance Music Participants feeling guts in the Tactile Haunted House prepared by the Transition students at the Miami Lighthouse. Members of the Alumni Group of the Delta Gamma Sorority from the University of Miami volunteered at Miami Lighthouse on Monday September 30th. These enthusiastic volunteers prepared and served lunch for our clients. The Delta Gamma collegiate and alumni groups are always involved with the community and have chosen to help at Miami Lighthouse whenever they can. Once again, we thank the Delta Gamma Alumni Group for their support and service to our organization. The Cornell University Alumni Club toured Miami Lighthouse on Friday, September 27. The group visited the Social Group Activities area, the Job Readiness Program and the Better Chance Music Production Program™. 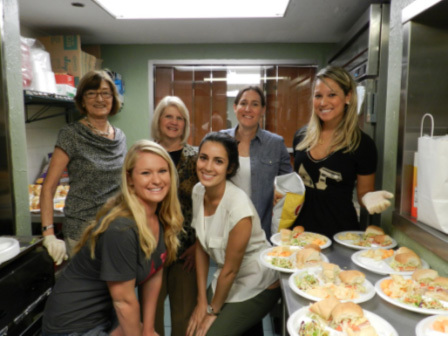 The Cornell alumni also took the opportunity to get involved by serving lunch to our clients. We thank them for spending time with us to learn about our organization. Miami members of the Cornell University Alumni Club. Former Dolphins player Nat Moore visited Miami Lighthouse on Monday, September 23. Mr. Moore, who has been recognized for his outstanding service to the community, currently serves as Senior Vice President of Special Projects and Alumni Relations for the Dolphins. During his tour, Mr. Moore visited the Better Chance Music Production Program™ as well as the Social Group Activities area and had the opportunity to speak with some of our clients about the importance of employment. We thank Mr. Moore for taking the time to learn about our organization. in the Better Chance Music Production Program™ studio. 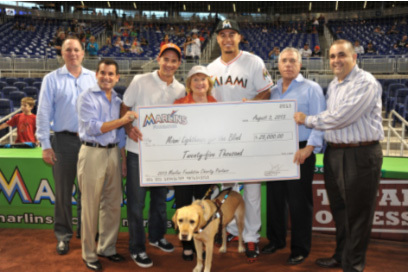 On August 3rd the Miami Marlins Foundation presented Miami Lighthouse with a $25,000 check as their 2013 Charity Partner during pre-game ceremonies at Marlins Park. The game was kicked off with Board Chair Agustin Arellano Jr. throwing out the first pitch. 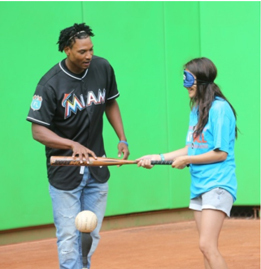 The Marlins Foundation Charity Partner Program was created to make a focused impact in philanthropy, and in collaboration with the Florida Heiken Children’s Vision Program more inner-city schoolchildren needing eye care will get the help they require to succeed in school. and Alfredo Mesa Executive Director of Miami Marlins Foundation. Board Chair Agustin Arellano Jr.
On Wednesday, July 10th thirty Miami Lighthouse for the Blind and Visually Impaired summer program students, ages 13 to 18, got the opportunity to take part in an exciting hands-on tour of Marlins Ballpark and learn about the traditions of America’s national pastime. With the help of Marlins Foundation staff, Miami Lighthouse summer camp students used their other senses like touch and smell to learn about the Ballpark. 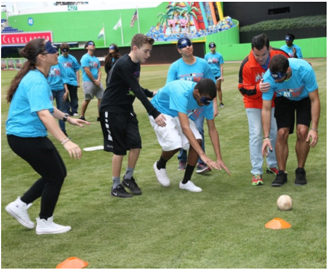 The students were exposed to a multi-sensory experience by having a special touch tour on the Marlins Ballpark field and were able to meet catcher Rob Brantly. 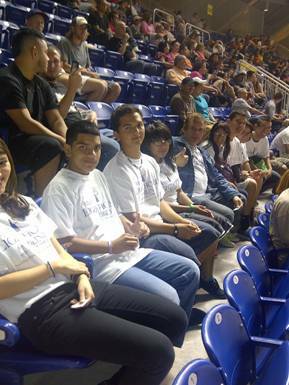 After the tour, summer program students were able to experience the Miami Marlins beat the Atlanta Braves 6-2. We thank Alfredo Mesa, Executive Director, and Joanne Messing, Director of Partnerships, of Miami Marlins Foundation for making this wonderful interaction for our summer camp students possible. On June 17th Miami Lighthouse unveiled the Lions Honor Wall “in appreciation of Lions Clubs International Foundation and Lions and Lions Clubs in District 35-A for their long-term commitment and assistance to the blind people of our community.” The Lions Honor Wall is in memory of Lion Oscar Vidal, founder of Lions Home for the Blind on July 24, 1974. 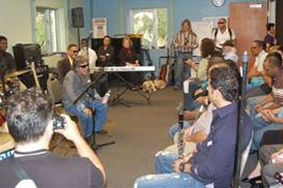 The ceremony took place at Miami Lighthouse for the Blind in the Social Group Activity classroom. Among the attendees were Lions District Governor 35 - N Juan Tejera, Lion Virginia Jacko CEO of Miami Lighthouse, and Lions Club members from Hialeah Pan-American, Miami Sunshine, Buena Vista, Coral Gables, Miami Five Stars, Miami, Maritime Lions Club Miami Cubans, Woman’s Club of Miami and Lions for the Blind Board of Directors. Family members related to Oscar Vidal also attended the ceremony. 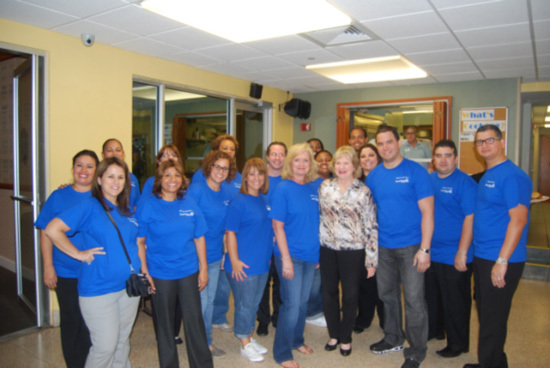 On June 12th Miami Lighthouse hosted JP Morgan CHASE Bank for a tour and volunteering with Miami Lighthouse Social Group Activities participants. Thank you JP Morgan CHASE Bank for your involvement with our programs. Dr. Harold and Gail Cohen, Miami Lighthouse Honorary Board Director Gloria Martin and CEO Virginia Jacko and Herb Klein. 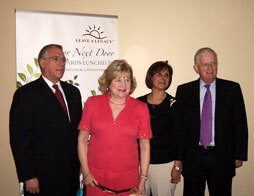 On May 8 Miami Lighthouse honored Dr. Harold and Gail Cohen and Herb Klein at the 12th Annual Leave A Legacy/Donor Next Door luncheon. 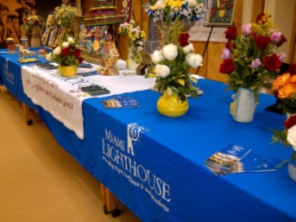 Dr. and Mrs. Cohen actively support various international and local charitable and educational activities of the community, including being honored by Miami Lighthouse as Ruby Jubilarians. Herb Klein is a Miami Lighthouse client and volunteer. He is a role model for our adult clients coping with vision loss and a passionate advocate for Miami Lighthouse and the way our vision rehabilitation services transform people’s lives. Herb volunteers in our training kitchen and speaks to community groups about his experiences at Miami Lighthouse. 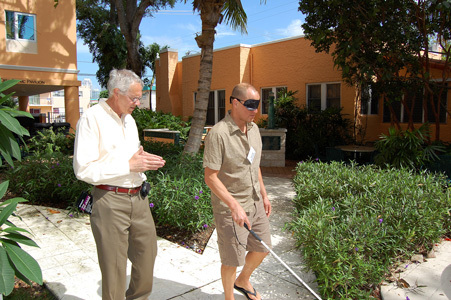 We deeply appreciate all of our generous donors and volunteers who help Miami Lighthouse provide hope, confidence and independence to blind and visually impaired individuals in our community. 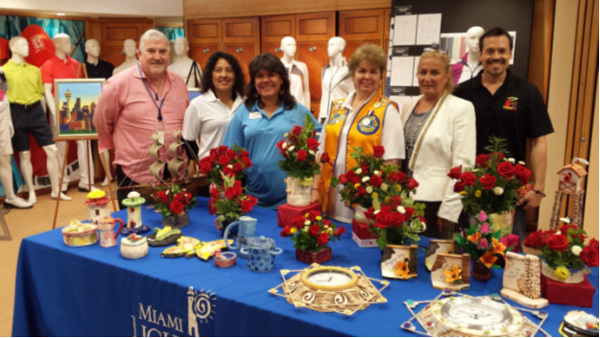 Perry Ellis International hosted on May 9th a pre-mother’s day arts sale benefiting the Miami Lighthouse Social Group Activities Program featuring ceramics, paintings, jewelry, jewelry boxes, and flower arrangements for Mother’s Day made by visually impaired program participants. These clients talked to Perry Ellis employees about how Miami Lighthouse teaches them to overcome the challenges of living with blindness. 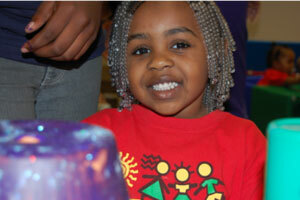 The arts and craft pieces were displayed and program participants showed how they create wonderful artwork. A recent grant from Perry Ellis provided guayaberas, golf shirts and polo shirts with the Miami Lighthouse logo to be used as uniforms. Miami Lighthouse looks forward to its future partnership with Perry Ellis International and thanks their staff for hosting the arts and crafts sale. Human Resources Administrator, at Perry Ellis International. 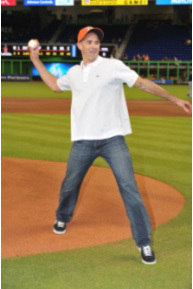 The Miami Marlins Foundation announced its 2013 Charity Partners during pre-game ceremonies at Marlins Park on April 27. As one of four charities selected in their highly competitive process, the selection of Miami Lighthouse was announced with a flag presentation by President David Samson. Recipients will receive a $25,000 gift from the Marlins Foundation. 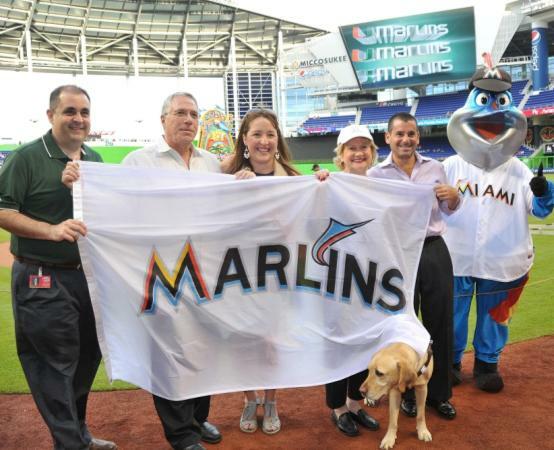 The Marlins Foundation Charity Partner Program was created to make a focused impact in philanthropy. As partners, more inner-city schoolchildren needing eye care will get the help they need by providing incentives for parents to take their child to their community optometrist collaborating with our Florida Heiken Children’s Vision Program. David Samson Miami Marlins President and Billy the Marlin. 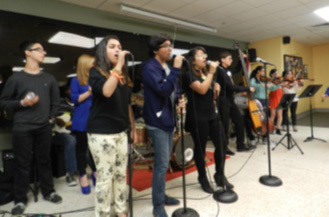 Miami Lighthouse Better Chance Music Production Program™ Students Performed During Spring Break at Jackson Memorial Hospital’s Newly Renovated Courtyard Delighting Doctors, Nurses, Patients and others. On Sunday, December 16th, twelve Miami Lighthouse students, ages 13 to 18, got the opportunity to take part in an exciting Miami Dolphins pre-game hands-on tour at Sun Life Stadium. The students were exposed to a multi-sensory experience by having a special touch tour at the Stadium. The students also got to feel and handle equipment used in the game, including helmets and footballs. 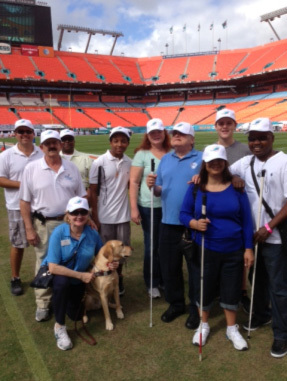 After the tour, Transition program students were able to experience the Miami Dolphins honor the 1972 Dolphins. The 40th Anniversary celebration of the only undefeated NFL team included the induction of coach Bill Arnsparger into the team’s Ring of Honor and speeches by Miami Dolphins owner Stephen Ross, Coach Don Shula and Dolphins President Mike Dee. The students then watched the game from a private suite from which they saw the Miami Dolphins beat the Jacksonville Jaguars 24-3. We thank Marcus Bach-Armas, Manager of Corporate Affairs for the Miami Dolphins, for making this wonderful interaction for our students possible. Miami Lighthouse students stand with Dolphins mascot T.D. Eric Ortiz touches game worn helmet and football. On April 18th the Miami Marlins Community Foundation hosted a 50/50 raffle to raise funds for the Miami Lighthouse Music and Transition student trip to Universal Studios over the summer. 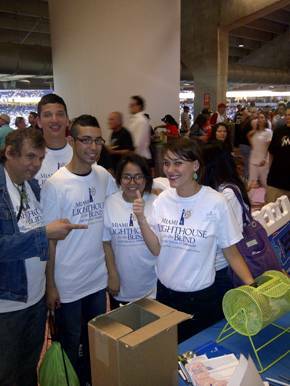 The students raised funds and handed out Miami Lighthouse brochures to patrons attending the Marlins game and were able to watch the Marlins claim victory over the Chicago Cubs 9-1. The Miami Lighthouse summer camp students would like to send a special thank you to the Miami Marlins Community Foundation for making this wonderful night possible. Miami Lighthouse students enjoy the Marlins win. 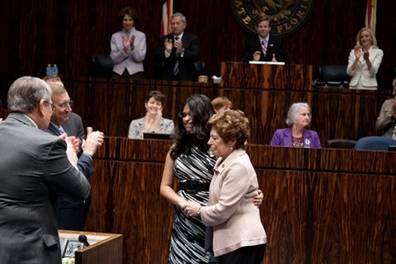 Natalia Sulca performed in Tallahassee at the State Capitol on January 10th 2012 at the invitation of Senator Nan Rich and sang “God Bless the USA” for the opening of session in the Senate. 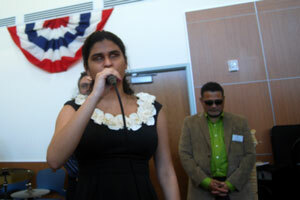 Natalia, 19, is a graduate of the nationally recognized Miami Lighthouse for the Blind Better Chance Music Production Program. 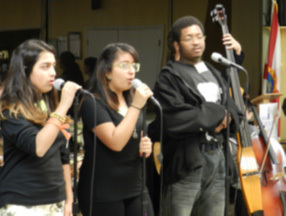 Natalia currently attends Berklee College of Music in Boston and has recently performed at the Discover Orange Bowl. To view the Capitol Updates news clip on Natalia’s performance please click here. 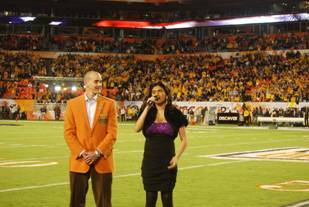 On January 4th Natalia Sulca was invited by The Orange Bowl Committee to kickoff the pre-game festivities at the 2012 Discover Orange Bowl. 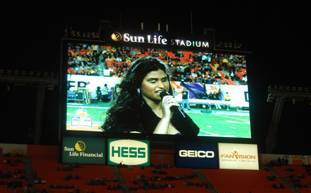 Natalia sang “God Bless the USA” a song written by country musician Lee Greenwood in front of an estimated crowd of over 70,000. Natalia said, “I am honored that the Orange Bowl Committee selected me to sing such a meaningful song in front of a great audience.” Agustin Arellano, Jr., member of the Orange Bowl Committee and board member of the Miami Lighthouse said, “I am very excited to bring these two organizations with rich traditions in the community together, and I am extremely happy Natalia was selected to perform.” The background music was recorded at the Miami Lighthouse Henry and Inez Stone Music & Sound Studio by Miami Lighthouse music students, Music Engineer Antonio Cobo, and Music Director Harold Cobo. Parachuters drop in as Natalia sings. Board Director Agustin Arellano Jr. watches Natalia perform. Reinaldo Sanchez and Glen Sulca. Natalia Sulca on the jumbotron. 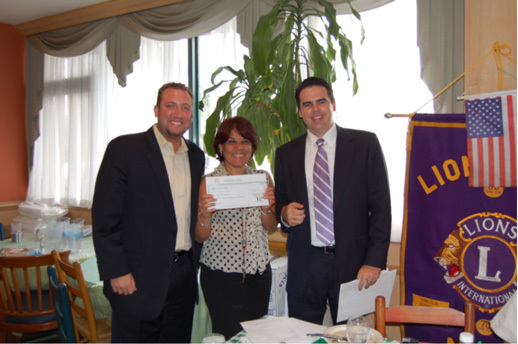 Edward Boland, right, President of the Lions Club of Miami presented a $3,000 check on May 5th to Nelba Gonzalez, Coordinator of Arts & Crafts/SGA, and Cameron Sisser, Manager of External Relations, representing the Miami Lighthouse for the Blind. The Lions annual donation is a contribution to the persons with sight disabilities and blindness of the Miami-Dade community that receive services from the Miami Lighthouse. 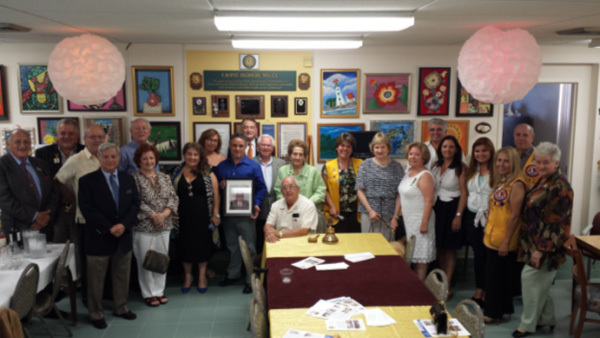 The Miami Lighthouse thanks the Lions Club of Miami for their continued support. 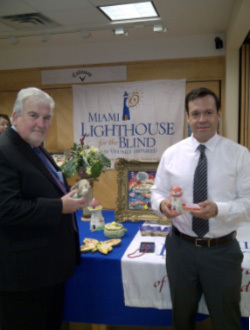 Cameron Sisser, left, Manager of External Relations for Miami Lighthouse for the Blind. 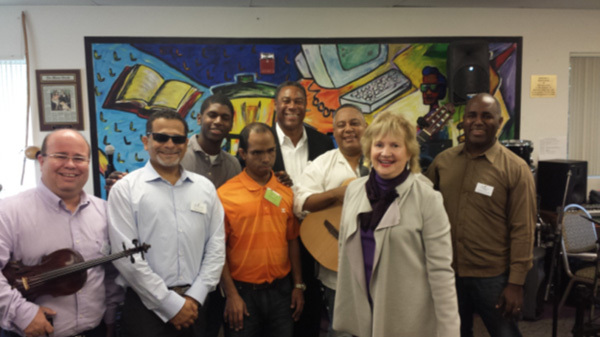 On March 17th Miami Lighthouse for the Blind Better Chance Music Production Program™ students performed in front of over 200 individuals taking part in the U.S. 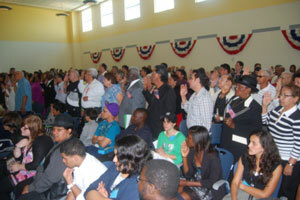 Citizenship and Immigration Services Naturalization Ceremony. 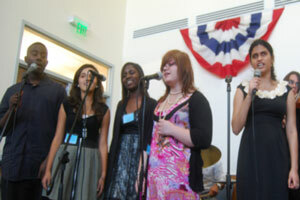 The students performed the National Anthem, God Bless the USA, Coming to America and I’m Yours a song by Jason Mraz. The audience enjoys God Bless the USA. 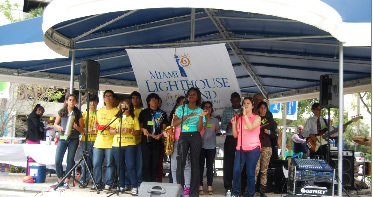 On March 16th the Miami Lighthouse celebrated their Spring Festival with the support of Credit Suisse and Hands on Miami. 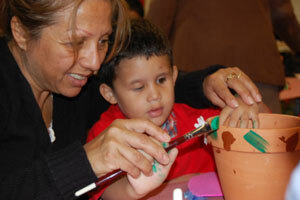 Hands on Miami provided an activity for the children which included painting and decorating flower pots and later planting flowers and herbs in the pots. At the end of the festival the volunteers from Credit Suisse and Hands on Miami had a shared reading session with the children. 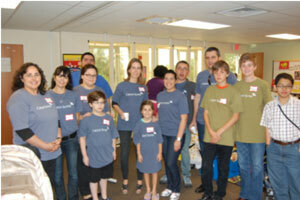 Thank you Credit Suisse and Hands on Miami for your involvement with our programs. Michael A. Silva, Esq. 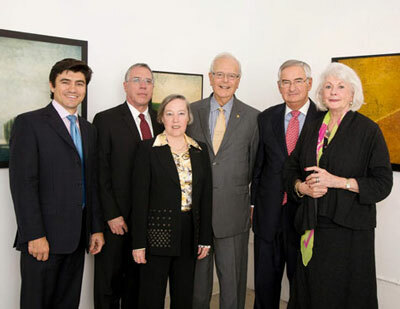 was installed as Chairman of the Miami Lighthouse Board of Directors at its annual meeting January 26th at the Kelley Roy Gallery. Mr. Silva has served two terms on the Miami Lighthouse Board of Directors and previously provided pro bono legal counsel, including revisions to bylaws and other board governance issues. "It is our pleasure to welcome Michael into this leadership position at Miami Lighthouse," said outgoing Board Chairman Owen S. Freed, Esq. "We look forward to working with him over the next two years as Miami Lighthouse fulfills its goals as a Center of Excellence in Low Vision and Vision Rehabilitation." "Michael's pro bono counsel and guidance as a Board Director has been such a blessing to us in recent years," said Miami Lighthouse President and CEO Virginia A. Jacko. "His forward-thinking leadership will help us accelerate our progress as we serve ever more people in this community." Mr. Silva is a Tax Partner with Hunton & Williams LLP. His practice focuses on international tax law, estate planning and representation of foreign investors and banks. He has been selected as one of "Florida's Legal Elite," a listing of the state's top 1.7% of "lawyers held in the highest regard," by Florida Trend Magazine three years in a row, and was named among the top lawyers in Florida by Florida Super Lawyers Magazine. He also was named one of the "Top Up and Comers in South Florida" for tax law by the South Florida Legal Guide. Mr. Silva graduated from the University of Florida Levin College of Law and the Fisher School of Accounting. 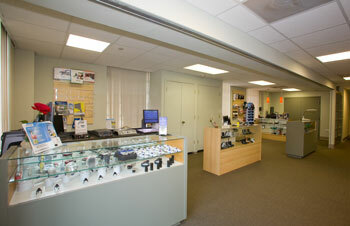 He is a Certified Public Accountant and certified by the Florida Bar in Tax Law and International Law. In 1993, he served as Judicial Clerk for the Honorable Allen J. Kornblum, Probate Division of Circuit Court, Miami. Owen Freed passes chairmanship to Michael Silva. 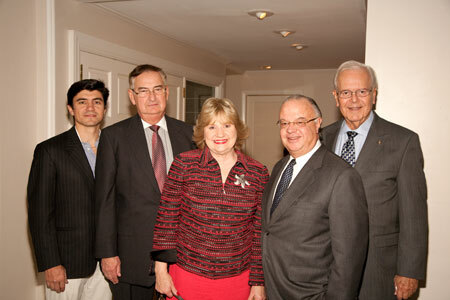 Michael Silva, Ray Casas, Donna Blaustein, Owen Freed, Bill Roy, and Susan Kelley. 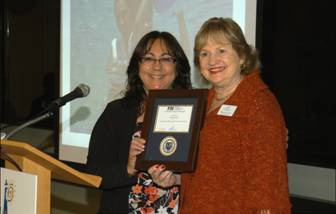 Alma R. Abdel-Moty, Dr. OT, MS, OTR/L and CEO Virginia Jacko. Amy McKenzie, Ed.D., and CEO Virginia Jacko. More than 70 professionals attended the Interdisciplinary Approaches to Low Vision Across the Life Span Seminar at Miami Lighthouse on November 6. The continuing education seminar held for occupational therapists, physical therapists and nurses was offered through a collaboration of Miami Lighthouse with Florida International University College of Nursing and Health Sciences thanks to Alma R. Abdel-Moty, Chairperson of the FIU Department of Occupational Therapy. The Health Foundation of South Florida provided partial underwriting for the event. Keynote speaker Tara A. Cortes, PhD, RN, FAAN spoke to guests on the topic of our aging population and the prevalence of low vision. Other guest speakers included Amy McKenzie, Ed.D., Florida State University; Jeanette S. Leonard, M.A., CCC-SLP/A, Purdue University; Lisa Roberts, DPT, PT GCS, Florida International University; as well as Rosemary Gonzalez, O.D., P.A., Consulting Optometrist at Miami Lighthouse. 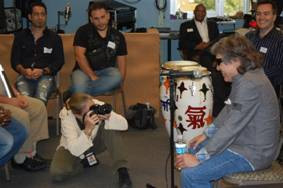 Eight-time Grammy Award winner José Feliciano delighted more than 20 aspiring blind and sighted musicians in the Better Chance Music Production Program™ when he visited them at the Miami Lighthouse Henry and Inez Stone Music and Sound Studio on November 18th. 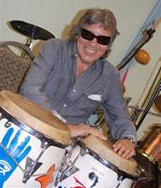 Click here to view an article that appeared in the Miami Herald about Jose Feliciano’s visit. Jose Feliciano speaks to the workshop group. The legendary Henry Stone, R&B music producer, tells his story. Jose Feliciano smiles for a Miami Herald photographer. Herald reporter interviews Edgardo Santiago. 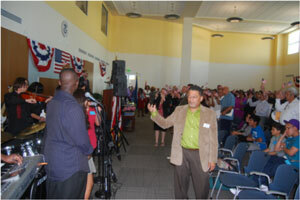 To learn more about Miami Lighthouse Job Readiness Program, please listen to the following testimonies. If you are unable to open the audio files, check the status bar at the top of the screen and click on "Run Active X". 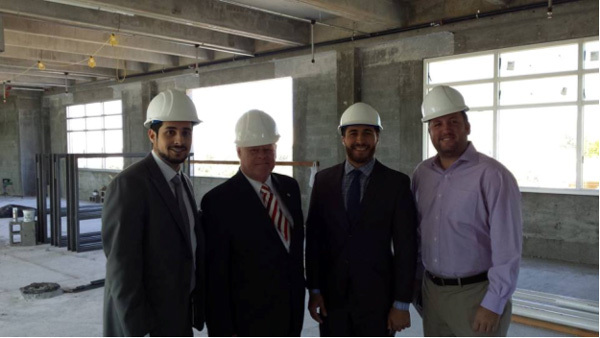 Superintendent of Miami-Dade County Public Schools, Alberto M. Carvalho, visited the Miami Lighthouse on July 26. He began his tour by visiting one of the three Heiken Children’s Vision Program mobile eye care units that have provided eye exams and glasses to over 40,000 low-income students in Miami-Dade County. Carvalho met with the Transition program students ages 14 to 22 as they introduced themselves and spoke about the schools they attend. He related to the students as he spoke about their Miami-Dade County School experiences, as he had once been principal or vice principal at several of the children’s schools. He admired many of the ceramic art pieces created by Miami Lighthouse clients in the Social Group Activities (SGA) program. Virginia Jacko and Nelba Gonzalez presented a ceramic lighthouse business card holder, which he gratefully accepted. Miami Lighthouse Music Program students performed two songs for the Superintendent, one being the students’ favorite song, “I’m Yours” by Jason Mraz, and the other “Proud to be an American” by Lee Greenwood. 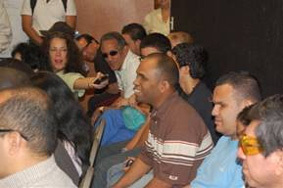 The tour concluded with President and CEO Virginia Jacko demonstrating how the blind and visually impaired learn to navigate a computer at Miami Lighthouse. Since 2003 Miami Lighthouse for the Blind Little Lighthouse program and the Miami-Dade Public Library System have teamed up for the Make-a-Bookmark Contest. The contest encourages participating children and their families to read books. All children in the Miami Lighthouse Blind Babies program who take part in the contest are recognized as winners for their participation and creativity. 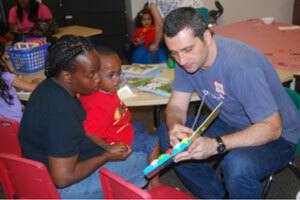 Click here to see bookmarks created by Miami Lighthouse Blind Babies program participants. Click here to see bookmarks created by Miami Lighthouse Blind Babies program participants featured on the Miami-Dade Public Library System Facebook page. At the Leave A legacy/Donor Next Door Luncheon Miami Lighthouse honored Board Director Ray Casas and Miami Lighthouse client and volunteer Hugo Meneses. Board Director Casas was recognized for his 18 years of service to the Miami Lighthouse in key leadership positions on the Board of Directors since 1992, including 10 years on the Executive Committee and his current position as Chairman of the External Relations Committee as well as for the pro bono services provided by his public relations firm. Wragg and Casas’ services include drafting and distribution of news releases, media relations and counsel on communications issues. Ray has provided important communications services and counsel throughout the years as a volunteer. 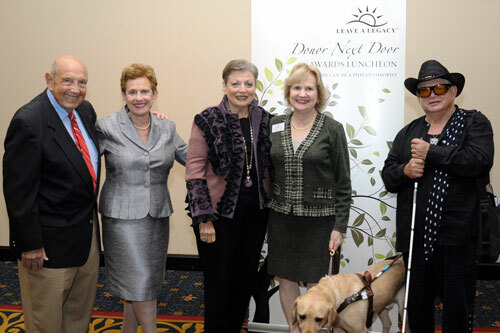 Hugo Meneses, a Miami Lighthouse client since 2003, received recognition as an extraordinary advocate for the blind and visually impaired. 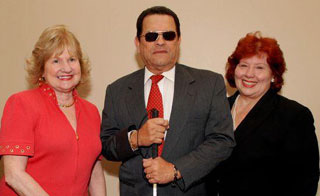 He has collaborated actively in raising funds for the Miami Lighthouse’s “White Cane Day” event, and in 2008 he was the individual who obtained the largest number of pledges. Each year he also solicits donations from the community in support of the event. 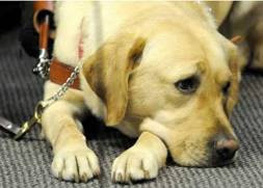 Hugo is a member of the “UCHEU” (Union de Ciegos Hispanos en los Estados Unidos), a non-profit that organizes recreational activities for the blind such as picnics, parties and field trips. Because of his many relationships in the community, Miami Lighthouse clients have meals that are more nutritious. The Board of Directors of Miami Lighthouse for the Blind and Visually Impaired, Inc. held its annual meeting at the Key Biscayne residence of Michael Silva, Esq., on January 27th. Mr. Silva has served in several Board governance roles for Miami Lighthouse, previously as Board Performance Oversight and Monitoring Committee Chairman and as Treasurer. 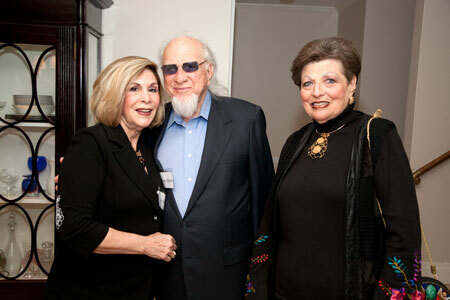 The fifty attendees at the annual meeting included Board Directors, Honorary Directors, members of the Heiken Children's Vision Program Advisory Committee, the senior leadership team of Miami Lighthouse, and Miami Lighthouse friends including the legendary Henry Stone, a former client and producer of 23 Gold and Platinum albums. Click here to read more. On June 16th, community leader Donna R. Blaustein, Esq. 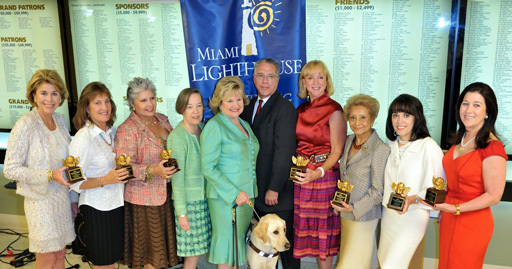 was named Miami Lighthouse for the Blind’s 2009 Woman of Vision in recognition of her many years of dedication and support of the Miami Lighthouse mission. 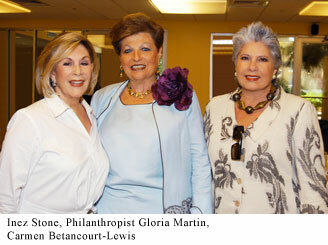 The prestigious award was presented at the third annual Women of Vision Luncheon at Miami Lighthouse on June 16th. More than 85 of South Florida’s most distinguished female leaders attended this luncheon, generously underwritten by Walter and Terri Shikany and co-hosted by Carmen Betancourt-Lewis, Carmen Bishopric, Shelley Beckwith Rutherford, Nancy Jean Davis, Pam Garrison, Norma Quintero & Terri Shikany. 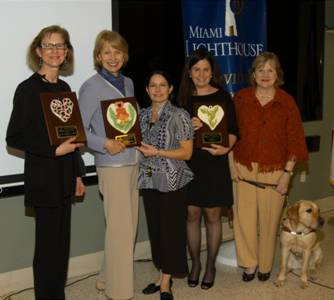 The Miami Lighthouse Woman of Vision award was established in 2007 to honor notable female philanthropists in our community. Past Woman of Vision honorees include Philanthropist Gloria Martin in 2007 and Philanthropist Jean Ellen du Pont Shehan in 2008. Awardees are presented a special one-of-a-kind signature pin designed by René Ruiz. 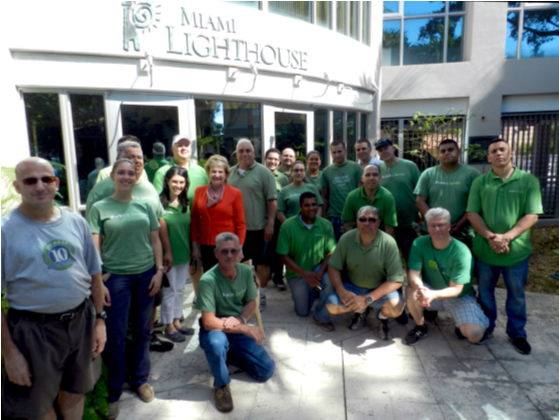 For the second year, Miami Lighthouse received assistance with a variety of tasks as volunteers from Deloitte pitched in to help on Deloitte’s annual “IMPACT” Day – a day to make an impact on the communities where they work and live. Woody Harrelson, who will play a blind pianist in the upcoming film Seven Pounds, found the perfect place to practice his “blindness” skills at Miami Lighthouse. Harrelson’s character befriends the main character, played by Will Smith, a guilt ridden and suicidal IRS agent. “I was more nervous about this role than about any I’ve ever had,” Harrelson said. The challenges of playing a blind musician are daunting, but Miami Lighthouse, with its vision rehabilitation services and groundbreaking music program, was an excellent fit for Harrelson as he prepared. He practiced the use of the white cane with Orientation & Mobility Specialist John Clapp, COMS, and observed blind keyboard artists practicing in the Henry & Inez Stone Music & Sound Studio. Harrelson, who entered the American consciousness as the affably dim Woody Boyd on the long-running TV series Cheers, has appeared in many major feature films, including Indecent Proposal, Play it to the Bone and The People vs Larry Flynt. Seven Pounds is scheduled to open in theaters in December. More than 50 friends of Miami Lighthouse gathered on August 5th to celebrate the Inaugural Men of Vision “Havana Nights,” hosted by Al Cabrera, Scott Sime, Eric M. Stein, and David Turner. Guests enjoyed live music as well as vintage and new cars featuring a placard noting historical milestones of Miami Lighthouse coinciding with the model year of each car. In keeping with the “Havana Nights” theme, a live cigar roller demonstrated his craft. 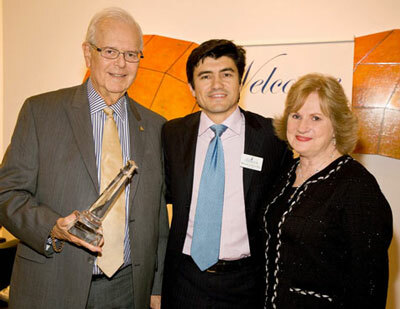 Legendary music producer and former Miami Lighthouse client, Henry Stone, was named the 2008 “Man of Vision.” Henry has been fundamental in the creation and success of the nationally recognized music program at the Lighthouse. 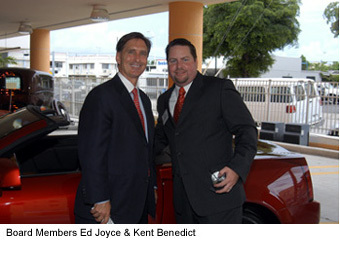 The event was sponsored by SunTrust Bank South Florida, Turner & Associates, LLP, CB Richard Ellis and Williamson Cadillac. 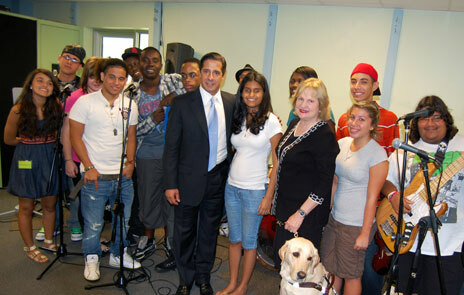 On July 3, 2008 Board Directors Ed Joyce and Kent Benedict along with colleagues from Northern Trust Bank visited Miami Lighthouse where they joined Lighthouse clients in the Gallery for lunch and were entertained by summer camp student musicians and instructors. The group toured the facility and learned about the many programs and services offered by Miami Lighthouse to blind and visually impaired children and adults. More than 50 of Miami’s most prominent female philanthropists gathered at Miami Lighthouse for the Blind and Visually Impaired June 24 at the second annual Women of Vision luncheon. The inspiring event included the presentation of the 2008 Woman of Vision Award to Jean Ellen duPont Shehan; the completion of Gloria Martin’s $1.1 million gift to Miami Lighthouse; news from CEO Virginia A. Jacko about new initiatives at Miami Lighthouse; a touching testimonial from Helen Mopsick, whose 6-month-old son Colton participates in the Miami Lighthouse Blind Babies program; and original music performed by the Miami Lighthouse musicians. 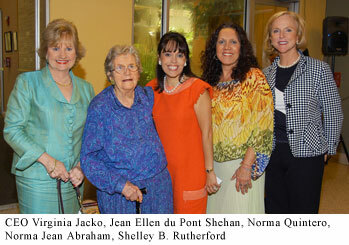 Norma Jean Abraham, Shelley Beckwith Rutherford, Jan Salvesen Morrison and Norma Quintero hosted the event.